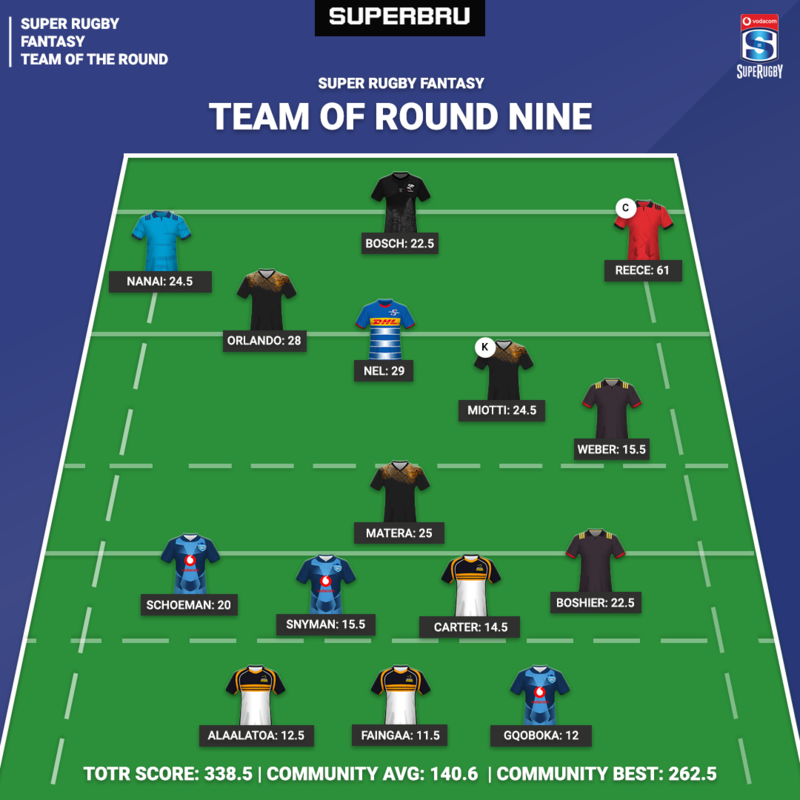 The stats show this to have been a tough Super Rugby round for the fantasy community, with the average round score the lowest it has been since Round 5 which included the cancelled fixture in Christchurch. Back-to-back superb performances from Sevu Reece means he's managed the impressive achievement of maintaining the captaincy in our Team of the Round. Having scored 30.5 points in this round, Reece is still yet to score less than 30 points in a Super Rugby game he has started this season (3 starts). Most represented teams in this week's TOTR: Brumbies, Bulls, Jaguares (3 players), Chiefs (2 players). Reece is joined by Melani Nanai and Curwin Bosch as this week's TOTR Outside Backs - both of whom picked up a lot of points for ball carries in this round. Dillyn Leyds (22) and Aphiwe Dyantyi (21) were also great OB picks as they each put in good displays on tour in Australia with their respective teams. As you may have noticed, this week's TOTR centres are very high scoring with the third best performing centre in Round 9, Tevita Kuridrani, scoring 19.5 points. Matias Orlando scored a hat-trick for the Jaguares in their dominant win in Durban while Ruhan Nel scored a brace against the Rebels and picked up 11.5 ball carry points. One of the more well-known fantasy options from the Jaguares squad is Pablo Matera and he again performed well this week to retain his place from the last TOTR. The only Loose Forwards to score more fantasy points than Matera so far this season are Ardie Savea, Akira Ioane and Daniel du Preez. Lizo Gqoboka also makes the weekly best performing XV yet again and is now the highest scoring prop in our game so far this year. Well done to this week's best performing bru in the whole of our SR fantasy game - Sikelela Zelanga from South Africa! 'Siki's Superb Alpacas' scored a very impressive 262.5 points in this round and included all three of the TOTR Outside Backs with Reece as captain! Finally, a note on today's sad news about Damian McKenzie who is ruled out for 8-9 months with an ACL injury. Not to say that you should remove him from your fantasy team (though you of course should), but to say that we wish him the best with the recovery process. He'll be missed by all at the World Cup later this year. Best of luck to you all in Round 10 which is another 6-game round that starts on Friday with the Chiefs taking on the Lions. I hope our Global Yellow Cap Winner has good bench cover and gets lucky with International Rep rotations & injuries. None of his 3 Crusaders, 2 Bulls or 1 Jaguare play next round. Was this a deliberate gamble by him though?